The second born in a family of six was born and raised in Majengo, Mombasa. She attended Makande Primary School, but unfortunately did not sit for her KCPE exams because her family could not raise the money required for registration. “It’s only my two brothers who have successfully studied to form four. My younger sister dropped out at standard five and another completed her primary education, but did not make it to secondary school,” said Nyota Ndogo. Locked out of secondary education by her family’s financial state, what encouraged her to push on? “What motivated me to keep on being positive about life is the condition I grew up in. Many children born in slums often suffer pessimism syndrome – they believe they are only meant for the slums, and that they cannot get out of the area,” she added. Her mother had to go and fend for the family; consequently leaving Nyota Ndogo to fend for her younger siblings. After dropping out of school, Nyota Ndogo decided she will not sit around and wait to be married off. “After mum told me that she did not have enough money and that I had to drop out of school, I told her I won’t continue to live in the slums. I embarked on a job hunting journey in Old Town, Mombasa,” recalls Nyota Ndogo. What motivated her to look for a job as a domestic servant, despite the ‘lowly’ status that most people ascribe to that profession? “Where I lived young girls were getting impregnated day in, day out – especially if they weren’t going to school. I did not want to end up like them. If I got pregnant while living under my mum’s roof, I would have just added poverty to my family,” said the Watu na Viatu star. Every morning, Nyota Ndogo would leave for Mombasa’s CBD; knock on one door and another, asking if she could do house chores in exchange for a few extra shillings. Often, she would be turned away, but she did not relent. Out of sheer desperation, she threw composure to the wind. Right there and then, she broke into tears and begged for the job. “My heart sunk, but I was determined to get the job. I begged, cried, pleaded with the family to give me the job – I asked them not to judge me, and even told them where I came from I did literally every house chore. I pleaded with them to put me on probation of two weeks – just to prove them that I could do the work very well,” recounted Nyota Ndogo. Her cry melted the heart of her potential employers. Unlike today’s house managers who receive well over Ksh7000 monthly pay, Nyota Ndogo had to survive on Ksh1500 salary. “I was receiving Ksh1500 as my monthly payment. I was using that money to only buy sanitary towels. The other necessities like food, clothing and shelter were being provided for by the family I worked for. I could stay away from home for four months; after which I would visit my family with goodies; bought from my meager earning,” said Nyota Ndogo. The pop singer enjoyed a cordial relationship with her employers; a connection which will see her nurture her budding music career. 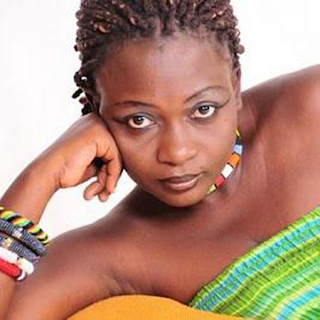 Nyota Ndogo says her employers encouraged her to pursue her dreams. The 34-year-old singer says convincing her mum to move out of the slums after she made a name in the music industry was an uphill task. “My mum did not want to be taken out of the slum. Being the big name that I was, and still is; my mum still refused to leave the slums. She told me I could not afford to consistently pay for her monthly rent and upkeep. She was used to living in a house which is not connected to electricity or water system,” reveals the renowned singer. Despite her mum’s persistent protests, Nyota Ndogo was utterly uncomfortable with her mother’s housing situation. “It affected me because I was a big name, but that did not reflect in my mum’s living condition. There were people who used to go and ridicule her,” added Nyota Ndogo. One day, the singer finally succeeded in convincing her mother to leave the slums – not by words, but through tears. Nyota says she won’t bow to pressure to live a lifestyle which is way beyond her means, just to fulfill societal expectations. The Mambo Kombo hit-maker says she doesn’t subscribe to the YOLO philosophy. “Some say you only live once; I disagree. What happens when you die and leave a young family behind? They shouldn’t struggle so much after your death; you should not be that callous and selfish to deny your offspring an education and moderately comfortable life. According to the Mombasa-based singer, living modestly keeps gold-digging people out of your life. “When you are rich, showy and flashy, a lot of people will flock around you. They will praise you with insincere comments; but get poor, and see your true friends,” she advised. Nyota Ndogo says there are only three things in life which will never move her, even an inch. “One: people who say I am ugly. It’s my face, I won’t bleach, and I have accepted it as it is. Many at times people have animated my face and ridiculed it; but that’s the face God gifted me with. I have never been denied an opportunity to perform at a show because I am ugly,” stated the singer. Nyota Ndogo’s husband is Danish. She says those who criticize her for marrying a white man instead of a Kenyan man should know love is blind. The singer will travel to Denmark soon and will return to the country in April, 2016.